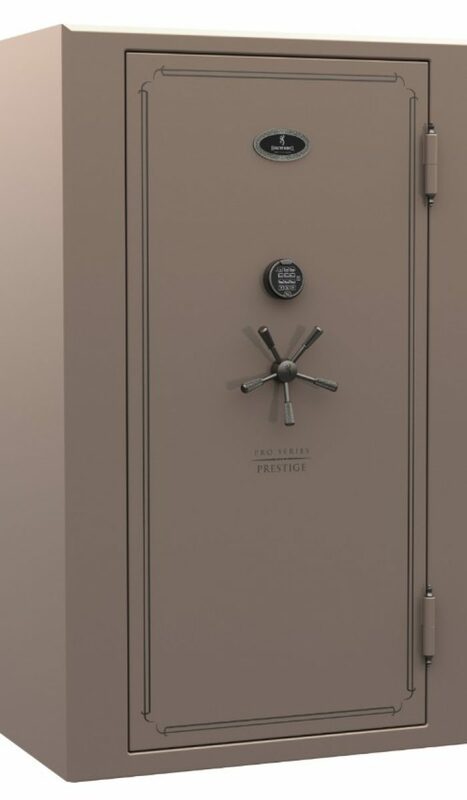 Gun Safes Long Island | Browning Prestige: Accu-Safes Inc. The smallest Prestige safe still has the impressive potential to hold up to 33 long guns. Like the larger Prestige models, this Standard size safe features the handsome Axis Adjustable Interior to aid in organizing your valuables. The shallow exterior dimensions of the PRS33 are designed to take up space along the wall instead of space within the room. The safe projects a mere 26" from rear to front, creating a less obtrusive footprint that fits into any living space in your home. 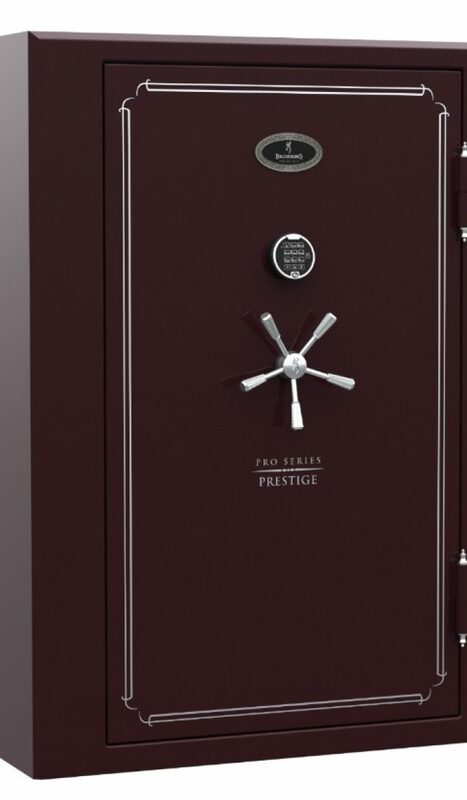 The PRS49 is the 4th largest safe in the Prestige line. Classified as a Wide safe, the spacious and modular interior is equipped to secure as many as 49 long guns, while keeping your other posessions organized and easy to locate. The exterior dimensions of the Prestige safes are designed to take up wall space instead of floor space; the safe projects a mere 26" from rear to front, creating a less obtrusive footprint that can be easily accommodated in just about any living space in your home. 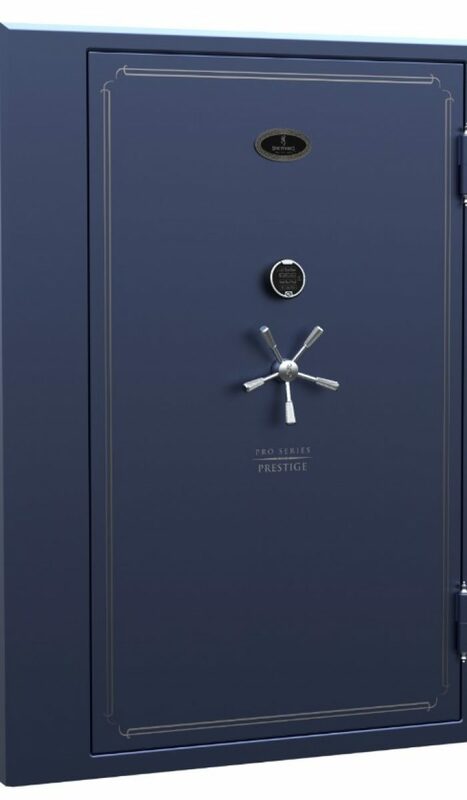 Protect your guns and valuables in a handsome Prestige safe. The Tall Wide PRS49T is the second largest safe in the Prestige line and features a spacious and modular interior capable of storing 49 long guns, with room to spare for your other posessions. The extra height of this model even accomodates the size of large caliber long range rifles. The exterior dimensions of this safe are chosen to take up wall space instead of floor space. This safe projects a mere 26" from the wall, creating a less obtrusive footprint to fit and allow this safe to fit in just about any living space in your home. Classified as an Extra Wide safe, the Prestige 65 offers the same cavernous width of the Prestige 65T without the additional vertical storage space. And with a 65 long gun capacity, you'll have plenty of room, in a accessibility-centril design that emphasizes width over depth. This design concept enhances accessibility to the rear of the safe and avoids dimensions that turn your safe into an obstacle rather than an elegant out-of-the-way adornment to your home. 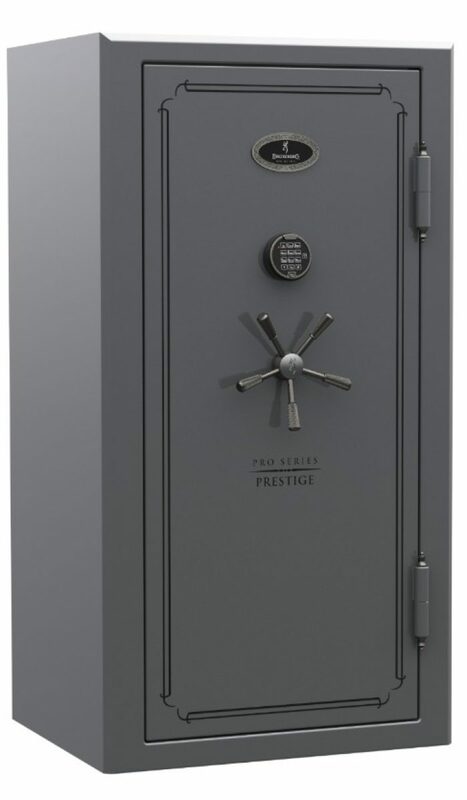 The Prestige line of safes are truly worthy of admiration. 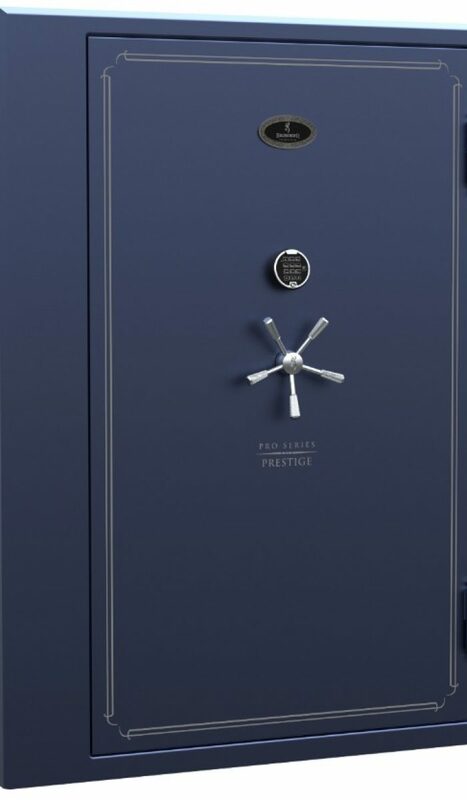 Cavernous in size, the Tall Extra Wide PRS65T is the largest safe in the Prestige line. It's spacious and modular interior is equipped to securely store 65 long guns, including large caliber long range rifles, with plenty of room to spare for your other valuables. The exterior dimensions of our safes are designed to take up wall space instead of floor space; the safe projects a mere 26" from rear to front, creating a less obtrusive footprint that can be easily accommodated in just about any living space in your home.